Diboll Lumber Workers, circa 1907. Image courtesy of The History Center Online. Image available on the Internet and included in accordance with Title 17 U.S.C. Section 107. DIBOLL, TEXAS. Diboll, on U.S. Highway 59 three miles north of the Neches River in southern Angelina County, was founded in 1894 when Thomas Lewis Latane Temple built a sawmill on the Houston, East and West Texas Railway. 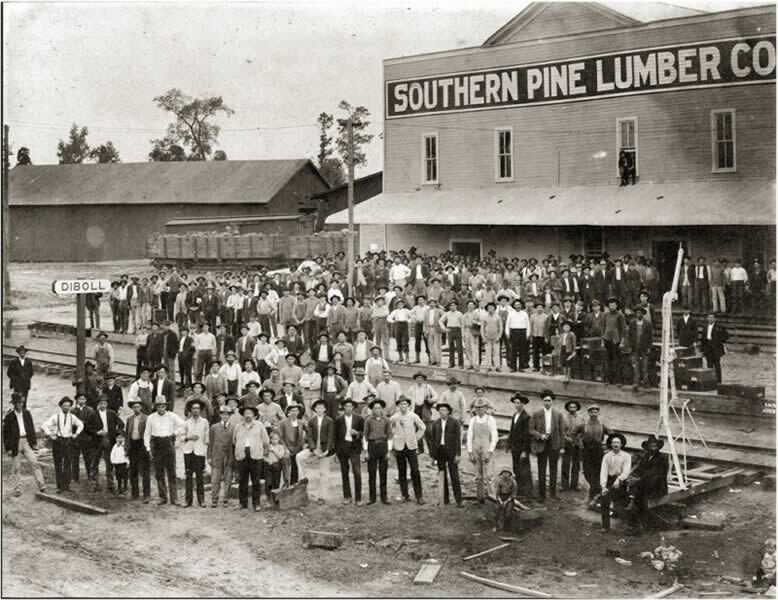 Temple came to East Texas in 1893, purchased 7,000 acres of pine timberland from J. C. Diboll, and began operation of his sawmill at Diboll in June 1894 under the name Southern Pine Lumber Company. By 1908 Temple had added a second sawmill at Diboll and enlarged his timberland holdings to 209,313 acres. In its early days Diboll was a company town. Many of its homes, built from lumber produced by the Southern Pine mills, were owned by the lumber company and rented to employees. Between the early 1900s and the 1950s the lumber company also maintained a large commissary, which included a drugstore, a post office, a grocery, and a feed store. Adjoining were doctors' offices, the railroad station, and lumber company offices. Diboll received a post office in 1897 with William P. Rutland as postmaster. The town's first school opened in 1894. The Great Depression of the 1930s saw Southern Pine Lumber Company sell about 100,000 acres of its holdings to the United States government for less than three dollars an acre to keep its sawmill working. Many Diboll employees repaid the loyalty the company had shown them by lending Southern Pine small sums of money they had saved during good years. Diboll remained largely a typical sawmill settlement until 1948, when Arthur Temple, Jr., a grandson of T. L. L. Temple, arrived to become manager and vice president of Southern Pine Lumber Company. When his father died three years later, he became president of the company. Temple used his influence and wealth to sell many of the company-owned houses to the townspeople and encouraged the building of private homes. He provided Diboll with a medical clinic, ambulance service, improved streets, a new fire station, and new homes. A shopping center replaced the old town commissary in the 1950s, a new bank was opened, school improvements were made, a radio station began broadcasting, and later a library was built. In 1962 the town was incorporated, with Clyde Thompson as the first mayor. Temple's policies were based on his recognition that company and town are interdependent and that the health of both depends upon conservation of the forests. T.L.L. Temple Memorial Library. Image courtesy of Billy Hathorn. Image available on the Internet and included in accordance with Title 17 U.S.C. Section 107. In 1984 the population was 5,500. Diboll remained a community economically oriented toward forest products such as lumber, plywood, flooring, treated timber, handles, and resins. In 1973 the town became the corporate headquarters for Temple Eastex, Incorporated, one of the nation's largest forest-product companies and a descendant of the old Southern Pine Lumber Company operations. The population of Diboll in 1990 was 4,341. In 2000 it was 5,470. Angelina County Historical Survey Committee, Land of the Little Angel: A History of Angelina County, Texas, ed. Bob Bowman (Lufkin, Texas, 1976). Megan Biesele, The Cornbread Whistle (Lufkin, Texas: Diboll Historical Society, 1987). Bob Bowman, The Towns We Left Behind (Diboll, Texas: Angelina Free Press, 1972). Paul Burka, "The King of the Forest," Texas Monthly, August 1982. Laurence C. Walker, Axes, Oxen, and Men: A Pictorial History of the Southern Pine Lumber Company (Diboll, Texas: Angelina Free Press, 1975). Handbook of Texas Online, Bob Bowman, "DIBOLL, TX," accessed April 22, 2019, http://www.tshaonline.org/handbook/online/articles/hfd02. Uploaded on June 12, 2010. Modified on April 25, 2016. Published by the Texas State Historical Association.